c. Assuming that both true and complement forms of the input variables are available, draw a circuit to implement F using the minimum number of 2 input NAND gates only. ABC : 000 -> 010 -> 111 -> 100 -> 011 -> 101. One possible implementation of the state machine is shown in figure. Specify what signals should be applied to each of the multiplexer inputs. 11. A 4 bit shift register, which shifts 1 bit to the right at every clock pulse, is initialized to values 1000 for (Q0Q1Q2Q3). The D input is derived from Q0, Q2 and Q3 through two XOR gates as shown in figure. a. Write the 4 bit values (Q0Q1Q2Q3) after each clock pulse till the pattern (1000) reappears on (Q0Q1Q2Q3). b. 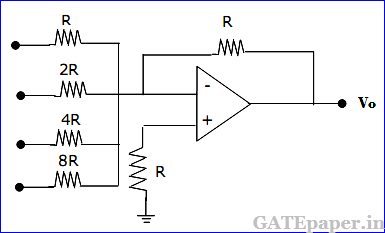 To what values should the shift register be initialized so that the pattern (1001) occurs after the first clock pulse? 12. It is desired to generate the following three Boolean functions using an OR array as shown in figure, where P1 to P5 are the product terms in one or more of the variables a, a’, b, b’, c and c’. Write down the terms P1, P2, P3, P4 and P5. 7. The decoding circuit is shown in figure, has been used to generated the active low chip select signal for a microprocessor peripheral (The address lines are designated as A0 to A7 for I/O addresses). For which address will the next instruction be fetched? 15. Circuit shown in the figure is an NMOS shift register. All transistors are NMOS enhancement type with threshold voltage VT = 1 volt. Supply used is VDD = 5 volts. Two non- overlapping clocks ø1 and ø2 are as shown in the figure is and have large pulse widths. All capacitors are initially discharged and the Vin = 0 volts is applied. If values of capacitors are C1 = 2 pF and C2 = 1 pF. Find out voltage VC2 on capacitor C2 after ø2 goes low. Neglect body effect on VT in your evaluation. 16. A sequence generator is shown in figure. The counter status (Q0Q1Q2) is initialized to 010 using preset/clear inputs. The clock has a period of 50 ns and transitions take place at the rising clock edge. a. Give the sequence generates a tQ0 till repeats. b. 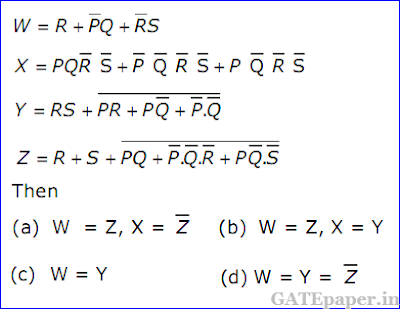 What is the repetition rate of the generated sequence? 17. An 8085 µP uses a 2 MHz crystal. Find the time taken by it to execute the following delay subroutine, inclusive of the call instruction in the calling program. You are given that a CALL instruction takes 18 cycles of the system clock, PUSH requires 12 cycles and conditional jump takes 10 cycles if the jump is taken and 7 cycles if it is not. All other instructions used above take (3n + 1) clock cycles, where n is the number of accesses to the memory, inclusive of the opcode fetch. 13. The mod – 5 counter is shown in the figure counts through states Q2Q1Q0 = 000, 001, 010, 011 and 100.
a. Will the counter lockout if it happen to be in any one of the unused states? b. Find the maximum rate at which the counter will operate satisfactorily. 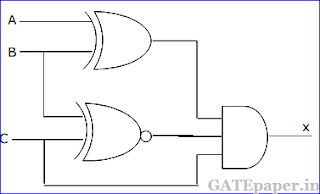 Assume the propagation delays of flip-flop and AND gate to be tFF and tA respectively. 14. For the TTL circuit shown in the figure, find the current flowing through the collector of transistor Q4, when Vo = 0.2 volts. Assume VCEsat = 0.2 volts, β = 100 and VBEsat = 0.7 volts. The α of Q1 in its inverse active mode is 0.01. 15. Write a short assembly language program, without using any arithmetic instruction, to store hexadecimal 5D in the flag register of 8085 microprocessor. Data in other registers of the processor must not alter upon executing this program. 9. 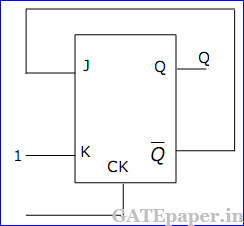 The circuit diagram of a synchronous counter is shown in the given figure. Determine the sequence of states of the counter assuming that the initial state is ‘000’. Give your answer in a tabular form showing the present state QA, QB, QC, J-K inputs (JA, KA, JB, KB, JC, KC) and the next state QA+, QB+, QC+. From the table, determine the modulus of the counter. 10. In a certain application, four inputs A, B, C, D (both true and complement forms available) are fed to logic circuit, producing an output F which operates a relay. The relay turns on when F(ABCD) = 1 for the following states of the inputs (ABCD): ‘0000’, ‘0010’, ‘0101’, ‘0110’, ‘1101’ and ‘1110’. States ‘1000’ and ‘1001’ do not occur, and for the remaining states, the relay is off. Minimize F with the help of a Karnaugh map and realize it using a minimum number of 3 input NAND gates. 11. 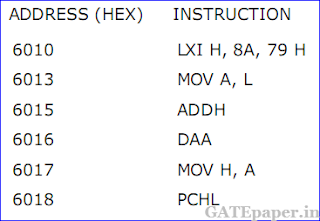 An 8085 assembly language program is given below. 12. For the CMOS monostable multivibrator of given figure, R = 50 KΩ and C = 0.01 µF, VDD = 5 volts, and the CMOS NOR gates have a threshold voltage (VT) of 1.5 volts. Vin is a trigger pulse (τp << RC) as shown in the figure. a. Plot VA1 and Vo1 as functions of time. c. Find the time period of the output pulse. 13. The operating conditions (ON = 1 and OFF = 0) of three pumps (x, y, z) are to be monitored, x = 1 implies that pump x is on. It is required that the indicator (LED) on the panel should glow when a majority of the pumps fail. a. Enter the logical values in the K map in the format shown in figure. Derive the minimal Boolean sum of products expression whose output is zero when a majority of the pumps fail. b. 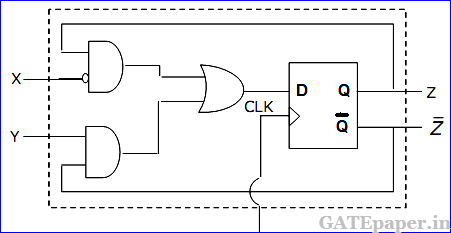 The above expression is implemented using logic gates, and point P is the output of the circuit, as shown in given figure, P is at 0 volts when a majority of the pumps fails and is at 5 volts otherwise. 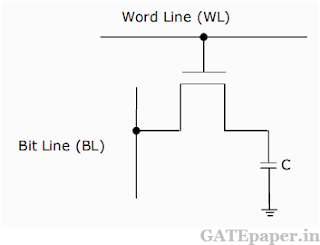 Design a circuit to derive the LED using this output. The current through the LED should be 10 mA and the voltage drop across it is 1 volt. Assume that P can source or sink 10 mA and a 5 volts supply is available. 14. 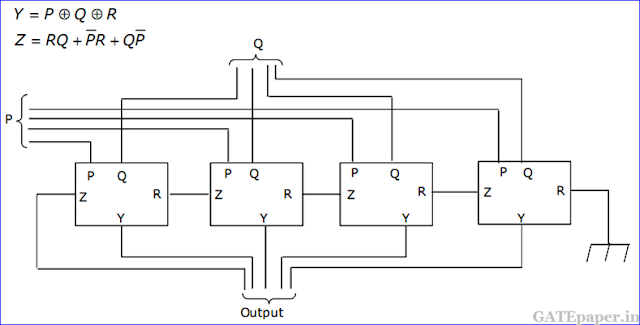 A one bit full adder is to be implemented using 8 to 1 multiplexers (MUX). a. 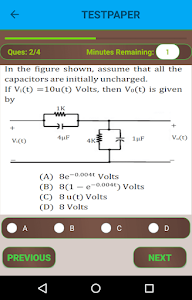 Write the truth table for sum (S) and carry to the next stage (CN), in terms of the two bits (A, B) and the carry from the previous stage (CP). 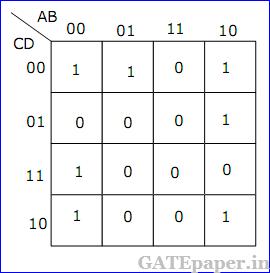 The truth table should be in the ascending order of (A, B, CP) i.e. (000, 001, 010..... etc). b. Implement S and CN using 8 to 1 multiplexers. The starting address of the above program is 7FFFH. What would happen if it is executed from 8000H? 2. For the ring oscillator shown in teh figure, the propagation delay of each inverter is 100 pico sec. 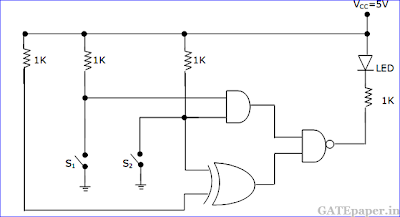 What is the fundamental frequency of the oscillator output? a. Emits light when both S1 and S2 are closed. b. Emits light when both S1 and S2 are open. c. Emits light when only of S1 or S2 is closed. d. Does not emit light, irrespective of the switch positions. 7. In the DRAM cell in the figure is the VT of the N-MOSFET is 1 volt. For the following three combinations of WL and BL voltages. 8. A monochrome video signal that ranges from 0 to 8 volts is digitized using an 8-bit ADC. a. 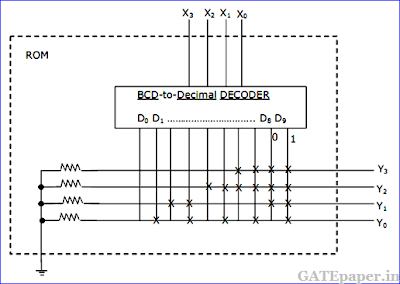 Determine the resolution of the ADC in V/bit. b. Calculate the mean squared quantization error. c. Suppose the ADC is counter controlled. The counter is up counter and positive edge triggered with clock frequency 1 MHz. What is the time taken in seconds to get a digital equivalent of 1.59 volts? 9. In the figure, the output of the oscillator, V1 has 10 volts peak amplitude with zero DC value. The transfer characteristic of the Schmitt inverter is also shown in the figure. Assume that the JK flip-flop is reset at time t=0. a. What is the period and duty cycle of the waveform V2? b. What is the period and duty cycle of the waveform V3? c. Sketch V1, V2 and V3 for the duration 0 ≤ t ≤ 6 µsec. Clearly indicate the exact timings when the waveforms V2 and V3 make high to low and low to high transitions. 10. For the digital block shown in the figure, the output Y = f(S3,S2,S2,S0), where S3 is MSB and S0 is LSB. Y is given in terms of minterms as Y = Σm(1,5,6,7,11,12,13,15) and its complement is given as Σm(0,2,3,4,8,9,10,14). a. Enter the logical values in the given Karnaugh map in the figure, for the output Y.
b. Write down the expression for Y in sum of products form using minimum number of terms. 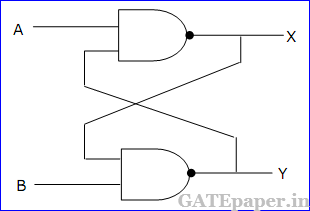 c. Draw the circuit for the digital logic boxes using four 2 input NAND gates only for each of the boxes. 11. Consider the following sequence of instructions for an 8085 microprocessor based system. a. If the program execution begins at the location FF00H, write down the sequence of instructions which are actually executed till a HLT instruction. Assume all Flags are initially RESET. b. Which of the three ports (PORT1, PORT2 and PORT3) will be loaded with data, and what is the bit pattern of the data? 7. Consider the following assembly language program. 8. 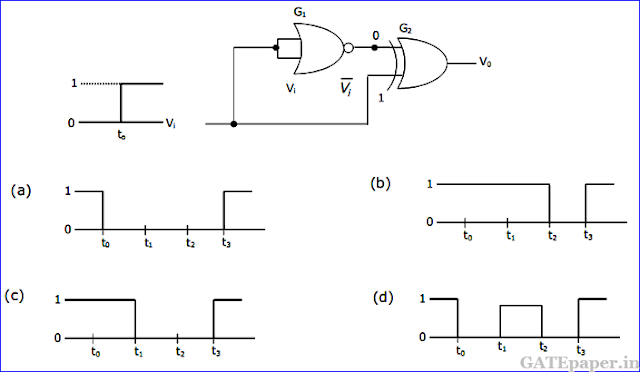 The inputs to a digital circuit shown in figure is are the external signals A, B and C. Assume complements of A, B and C are not available. The +5 volts power supply (logic 1) and the ground (logic 0) are also available. a. Write down the output function in its canonical SOP and POS forms. b. 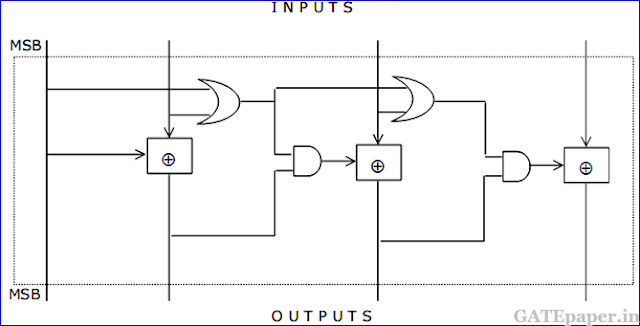 Implement the circuit using only 2 to 1 multiplexers shown in the figure, where S is the data select line, D0 and D1 are the input data lines and Y is the output line. The function table is also given for the multiplexer. 9. It is required to design a binary mod-5 synchronous counter using AB flip-flop, such that the output Q2Q1Q0 changes as 000 -> 001 -> 010..... and so on. The truth table for the AB flip-flop is given in figure. b. Obtain simplified SOP expressions for the inputs A2, B2, A1, B1, A0 and B0 in terms of Q2, Q1, Q0 and their complements. c. Hence complete the circuit diagram for the mod-5 counter given in the figure using minimum number of 2 input NAND gate only. 10. 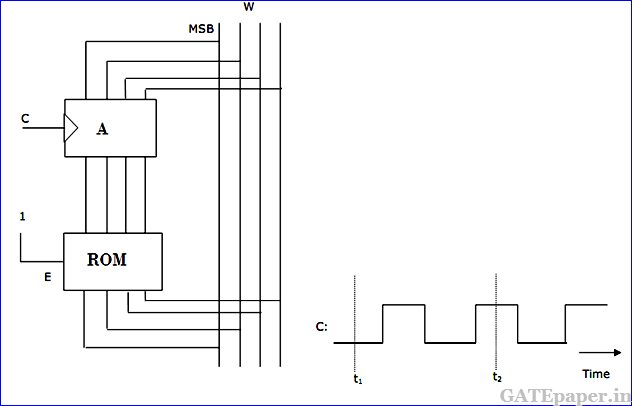 An 8085 microprocessor operating at 5 MHz clock frequency executes the following routine. a. Determine the total number of machine cycles required to execute the routine till the JMP instruction is executed for the first time. b. 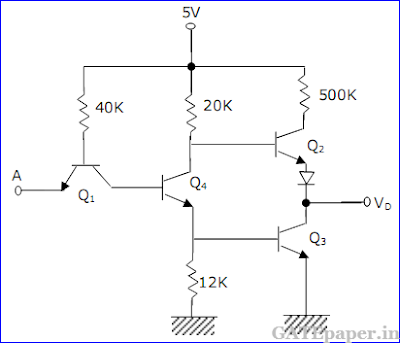 Determine the time interval between two consecutive (MEMW)’ signals. c. If the external logic controls the READSY line so that three WAIT states are introduced in the I/O WRITE machine cycle, determine the time interval between two consecutive (MEMW)’ signals. 6. The circuit shown in the figure has 4 boxes each described by inputs P,Q,R and outputs Y, Z with the following relation. 9. 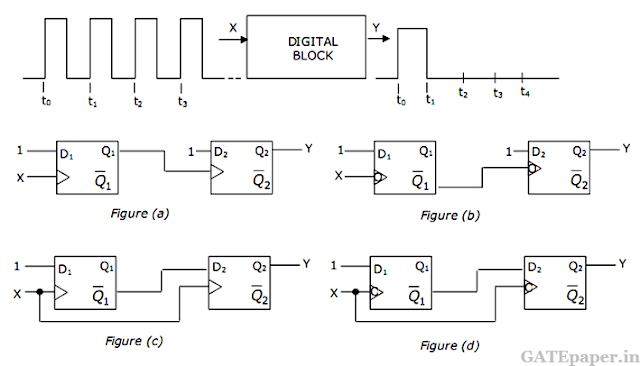 The DTL, TTL, ECL and CMOS families of digital ICs are compared in the following 4 columns. 10. The circuit shown in the figure is a 4 bit DAC. 12. In the circuit shown in the figure, ‘A’ is a parallel in, parallel out 4 bit shift register, which loads at the rising edge of the clock C. The input lines are connected to a 4 bit bus, W. Its output acts as the input to a 16 X 4 ROM, whose output is floating when the enable input E is 0. A partial table of the contents of the ROM is as follows.